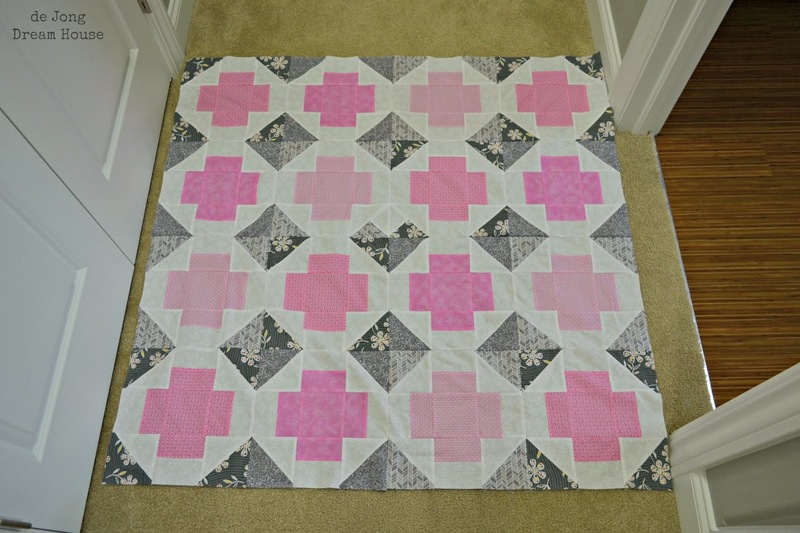 I'm typing up this post about my 10th quilt while on a break from sewing my 21st quilt. 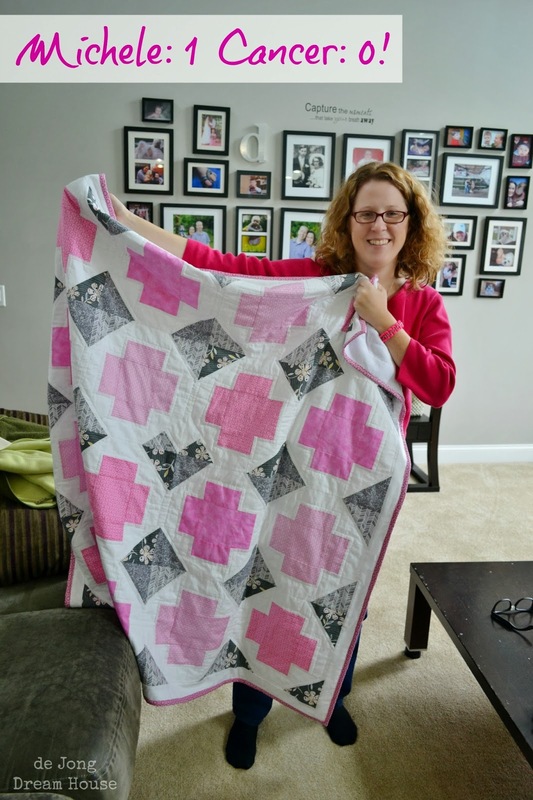 I have loved every quilt I've made because I've made them for people or causes important to me, but this one is one of my favorites. 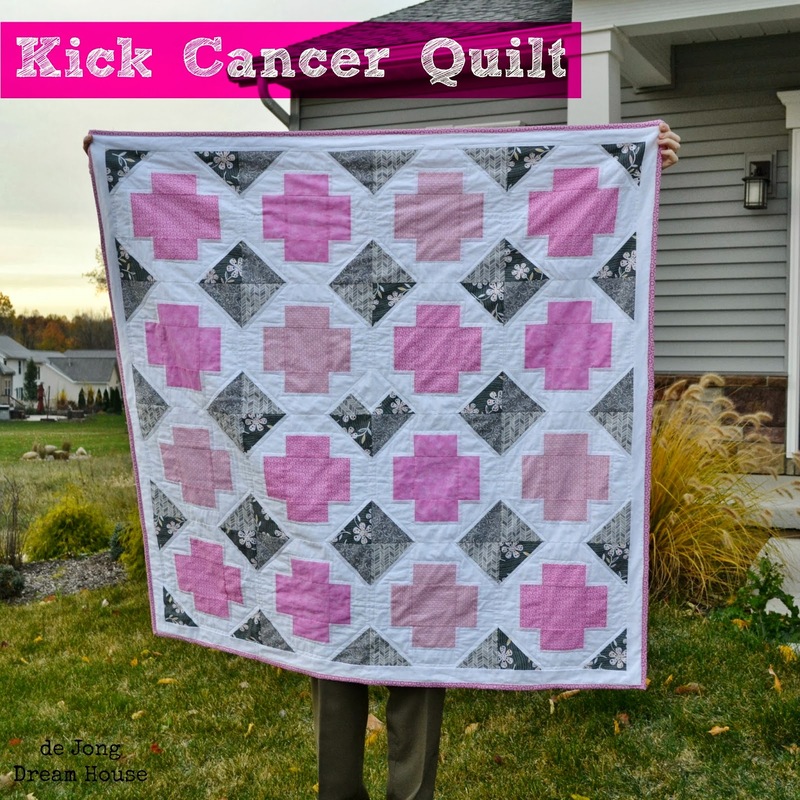 When my friend Michele was diagnosed with breast cancer, I knew I wanted to make her a "kick cancer" quilt to keep her cozy in the days ahead. I "sketched" out my idea on PowerPoint. 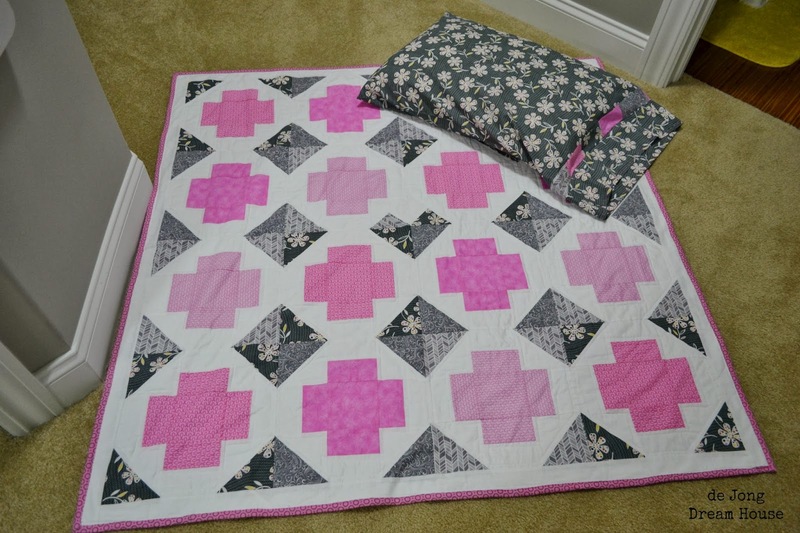 I had fun picking out fabrics for this quilt. 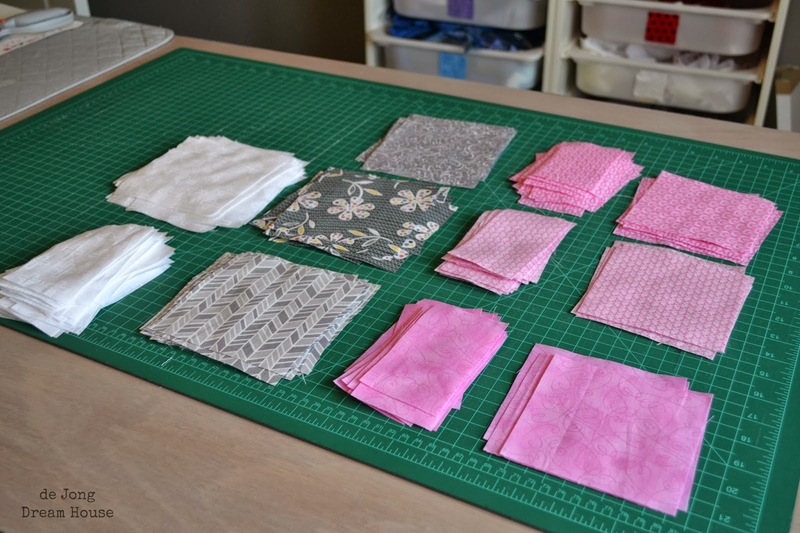 I ordered the two small print pink ribbon fabrics online. 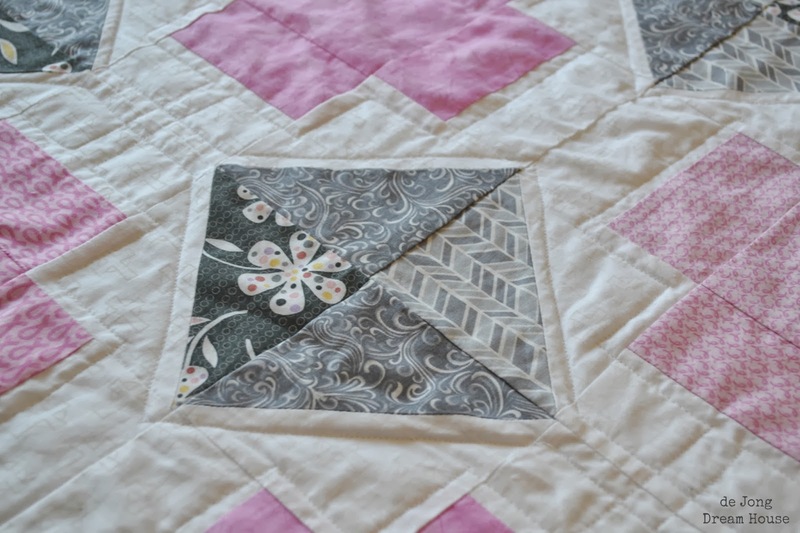 I learn something new (or two) with every quilt. 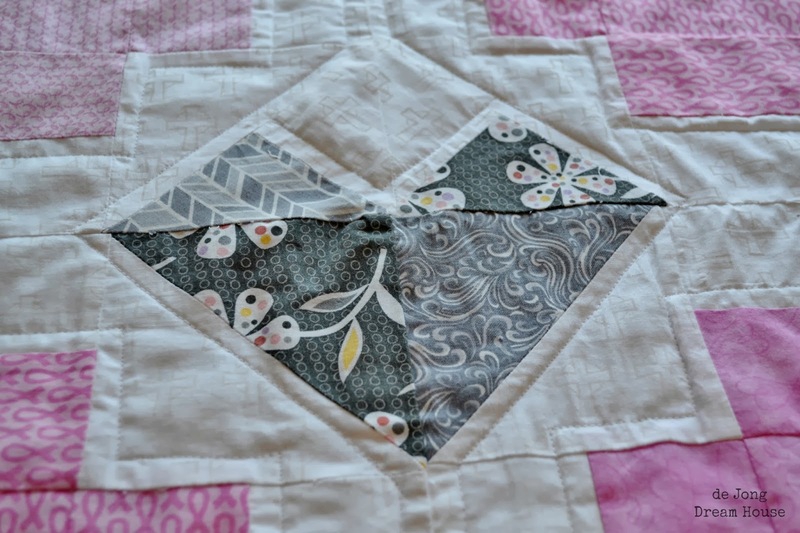 This time I learned about chain piecing. Wow! 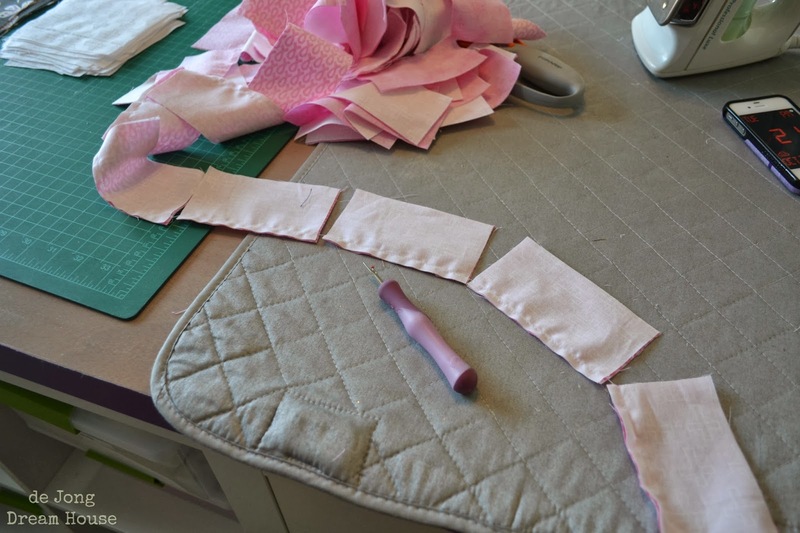 It sure saves a lot of time to sew all the pieces in a row (in a chain!) without snipping the threads in between each one. Saves thread, too! I've been spending a lot of quality time with my iron lately. Another lesson I learned. 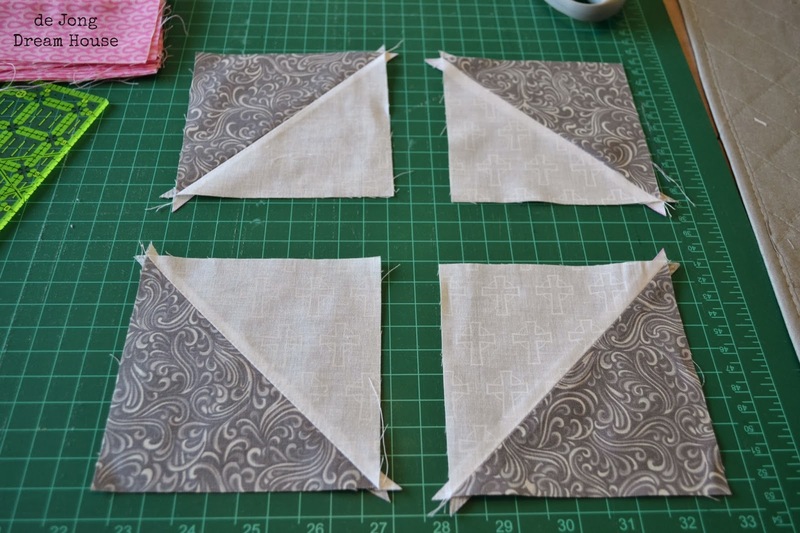 How to make half square triangles two at a time. First I drew a line on the lighter colored square, in this case, the white square. 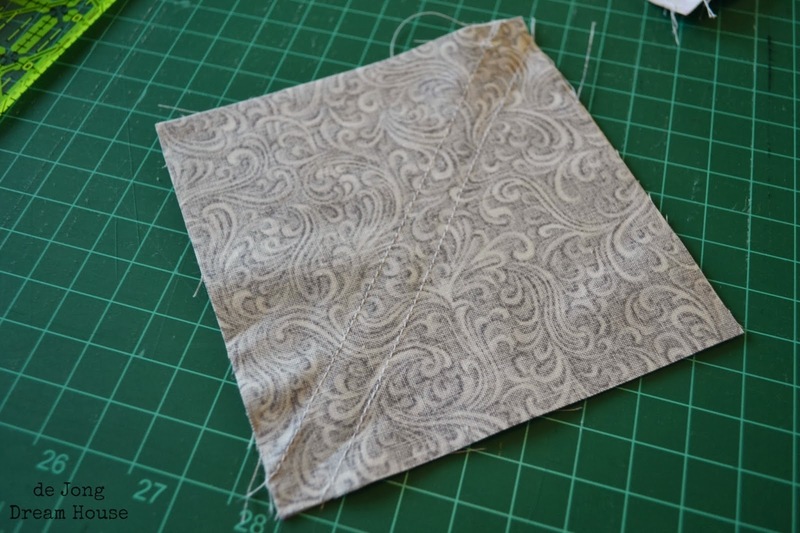 Then I sewed 1/4" on either side of the line. 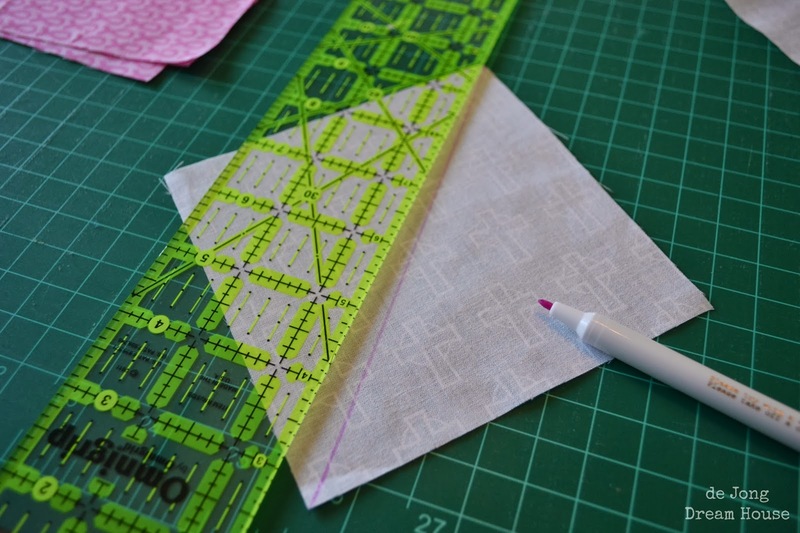 I cut on the original line I drew (or use my ruler to cut a straight line between the corners of the squares). And voila! 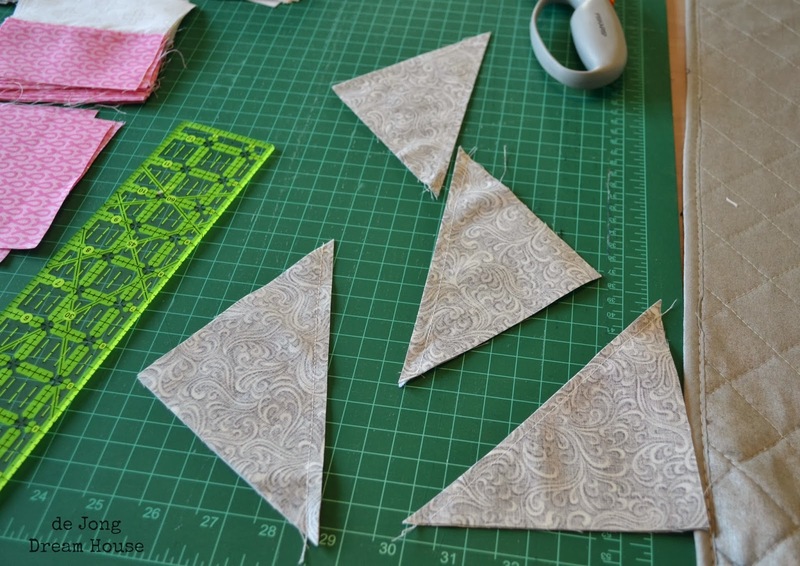 Pretty half square triangles ready to trim! 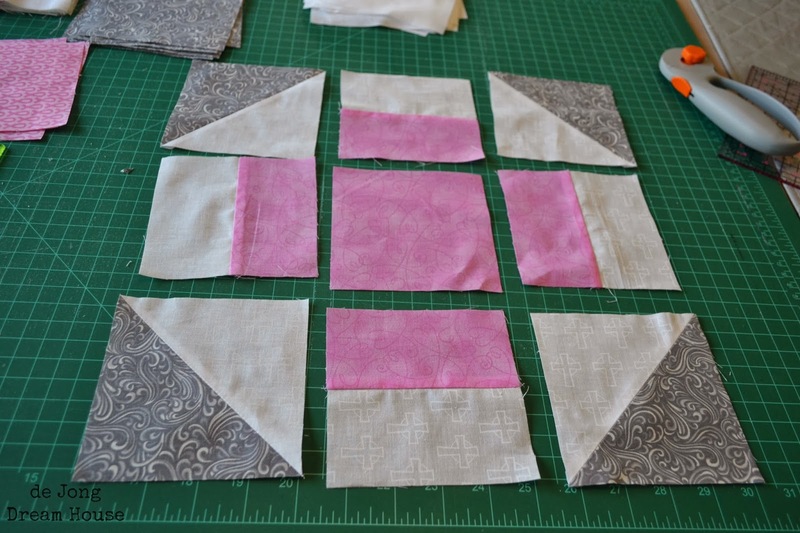 First block ready to sew together. 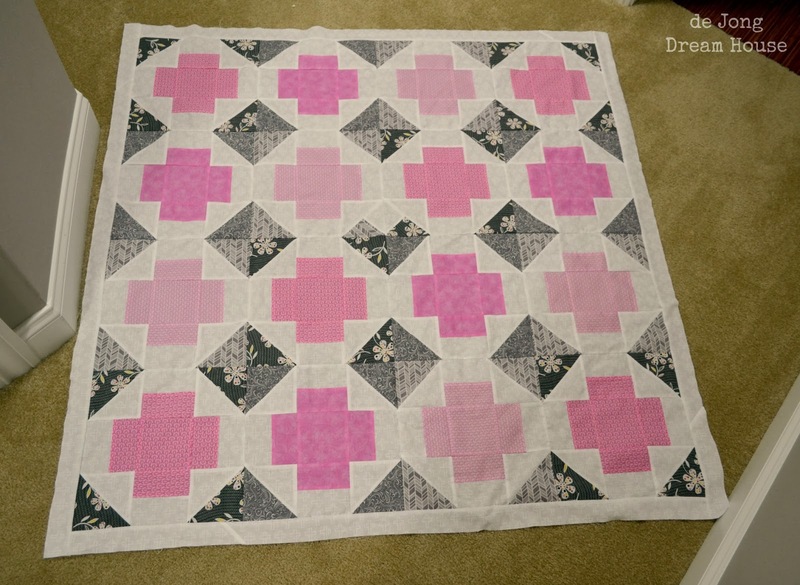 The piecing went together super fast. 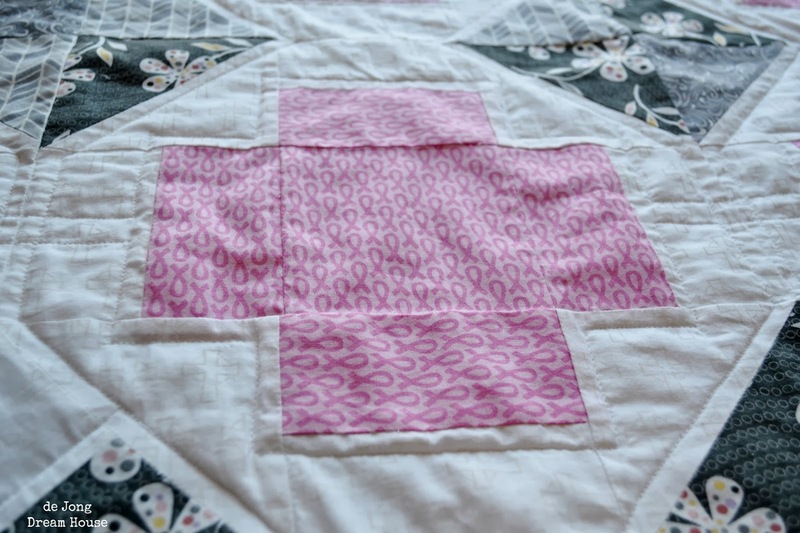 I liked the way the light brought out the crosses on the white fabric. It took me a few tries to get the heart in the middle correct. I'm sure there was an easier way, and I'll figure it out eventually. 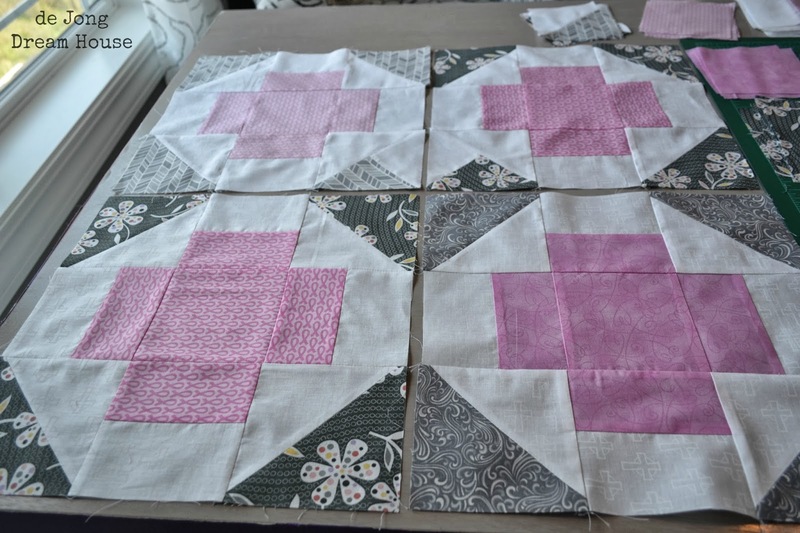 All the blocks pieced together. I added a simple white border to finish it off. 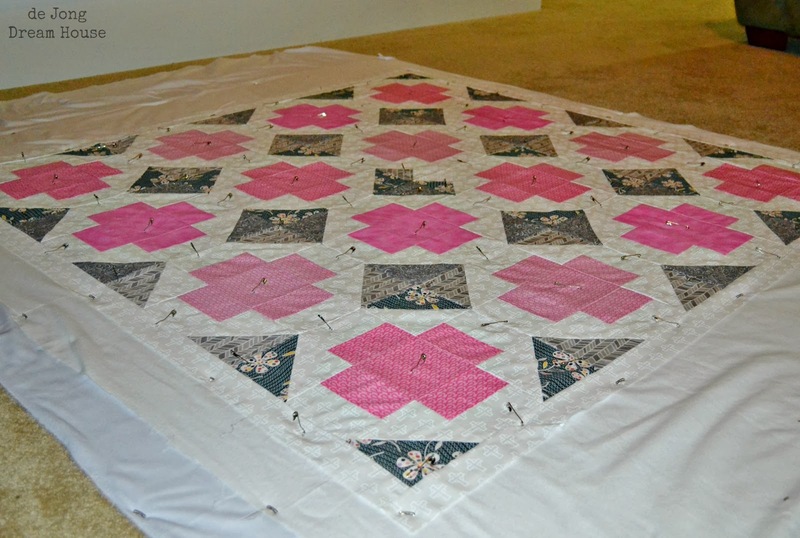 Pinned and ready to quilt. 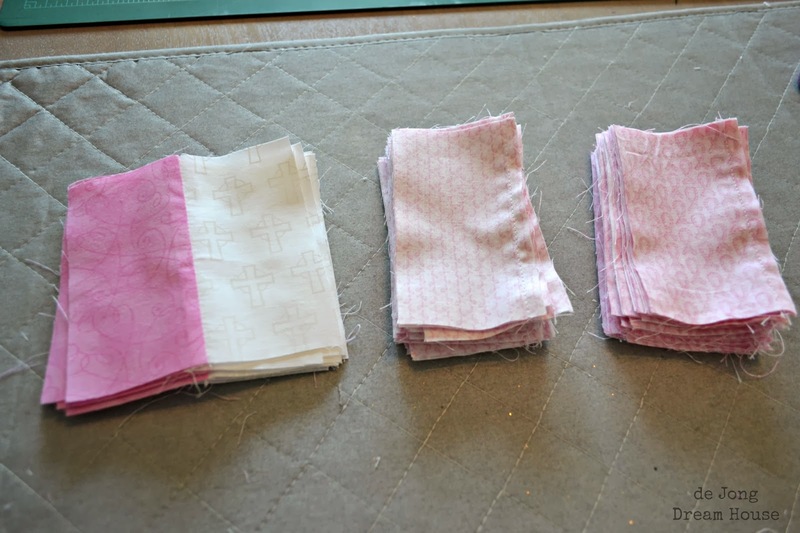 Quilting is not my favorite part of the process (read, I need a lot more practice! 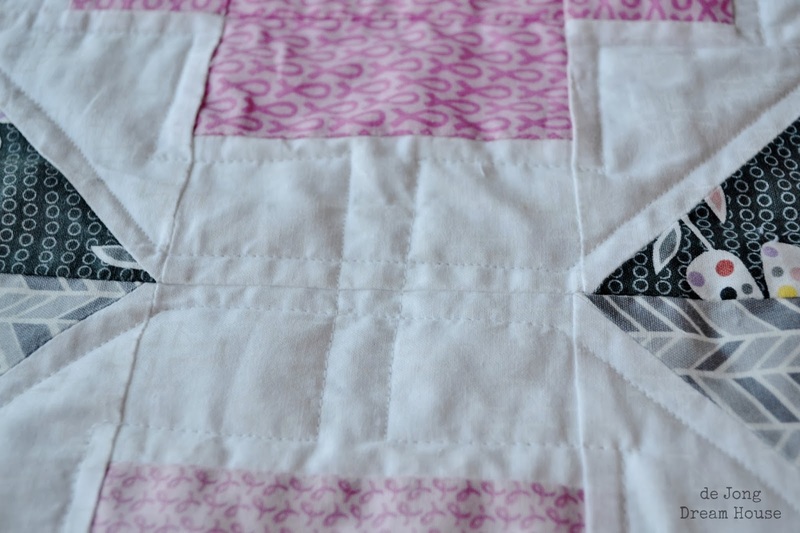 ), but I had fun with this one echoing the crosses, diamonds, and heart. 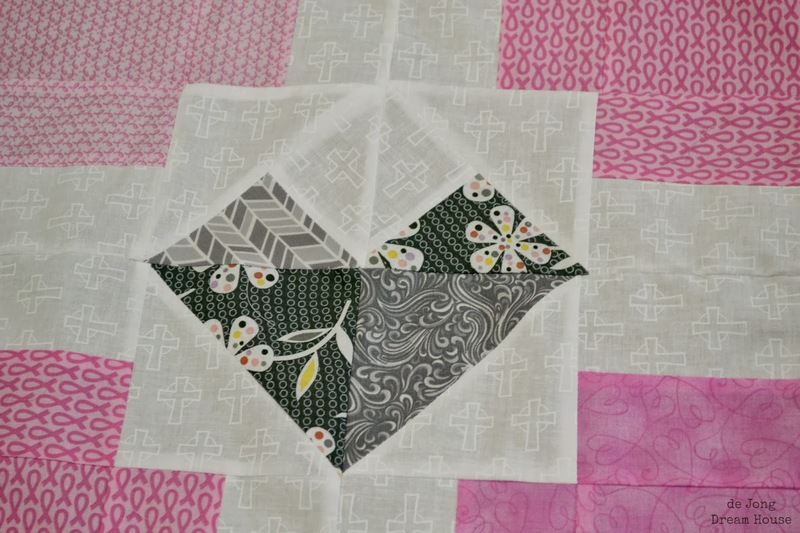 I really liked the pattern that was created by the crossed paths. 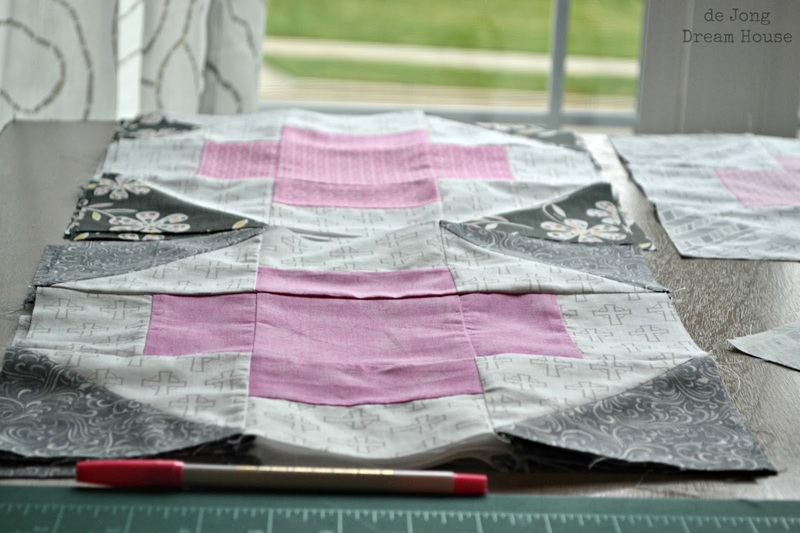 For the binding, I used some cute pink and gray fabric from my stash. 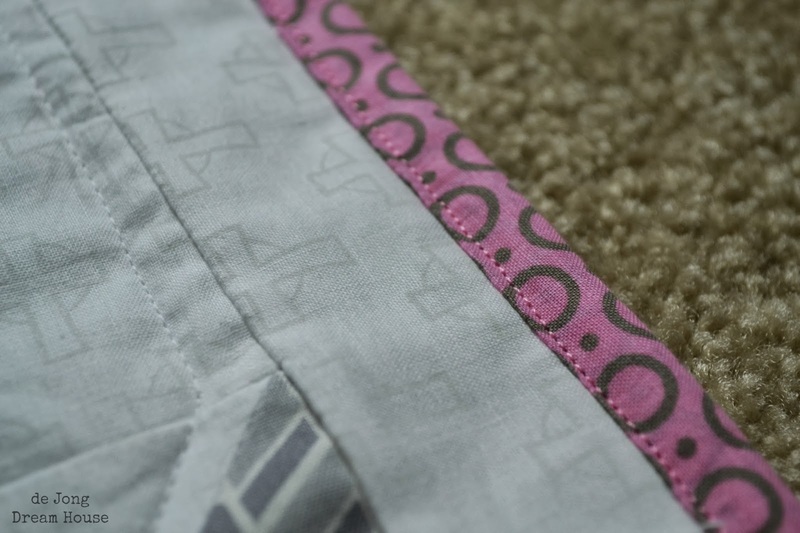 I may have finally figured out how to machine stitch the binding without one stitch weaving all over the place. 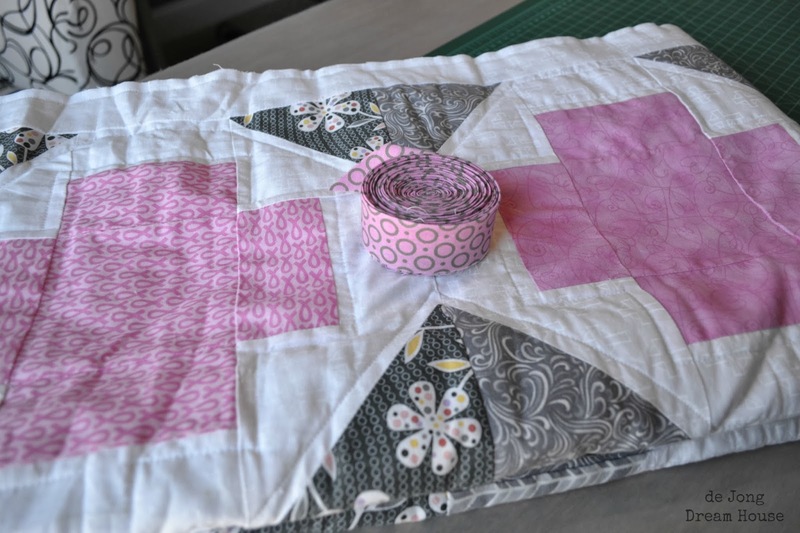 I also made a matching pillowcase to spruce up her hospital bed. 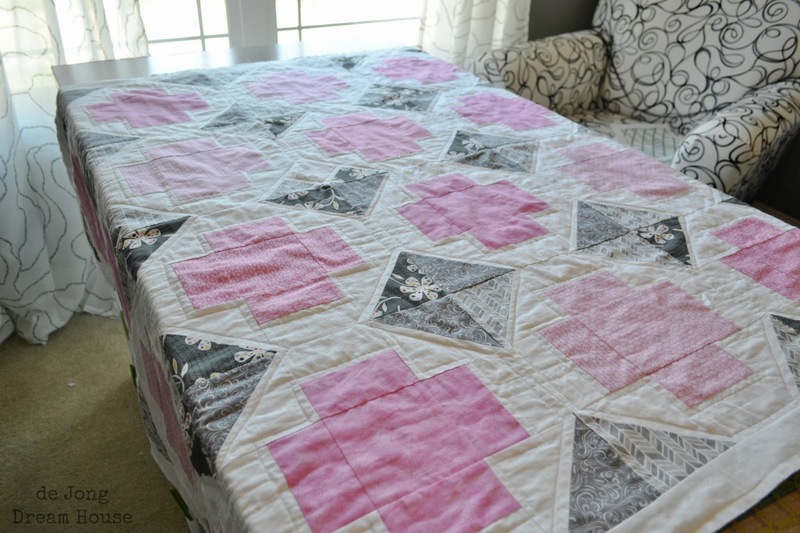 D gave the quilt a thumps up for coziness! And Michele liked it, too! this is a true piece of art! You have outdone yourself! 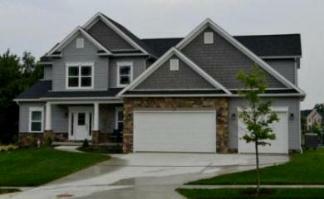 I love the colors and the cause....!! Thanks, Crystelle! That's a high compliment coming from you!! So beautiful and thoughtful. As a BC survivor, it's always heartwarming to see the good things that friends do. My prayers to Michelle and please have her stop by and say hello. Thank you! 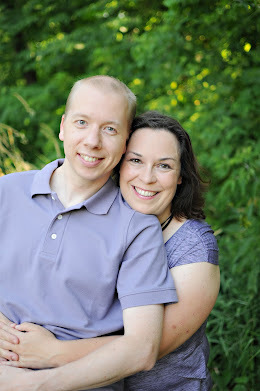 And I am so happy to know that you are a survivor, too! I love this! 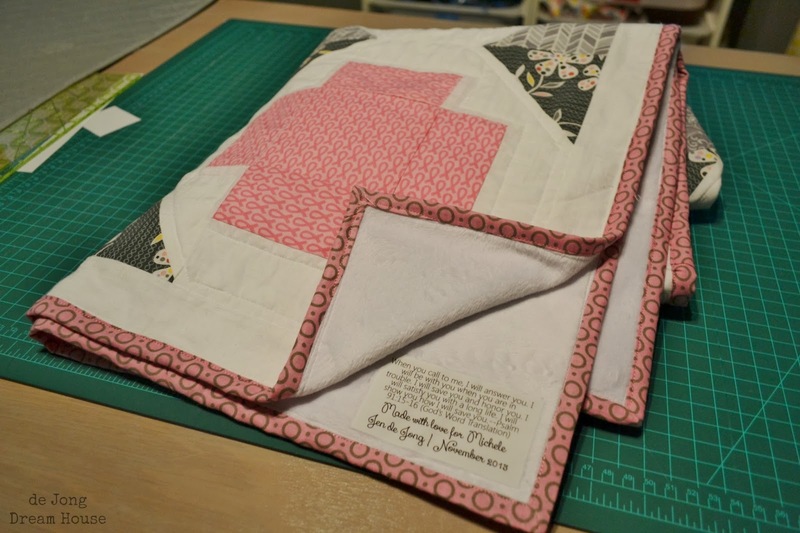 When I made my single block, I didn't even stop to think about what it would look like when repeated, but the diamonds are so cool. 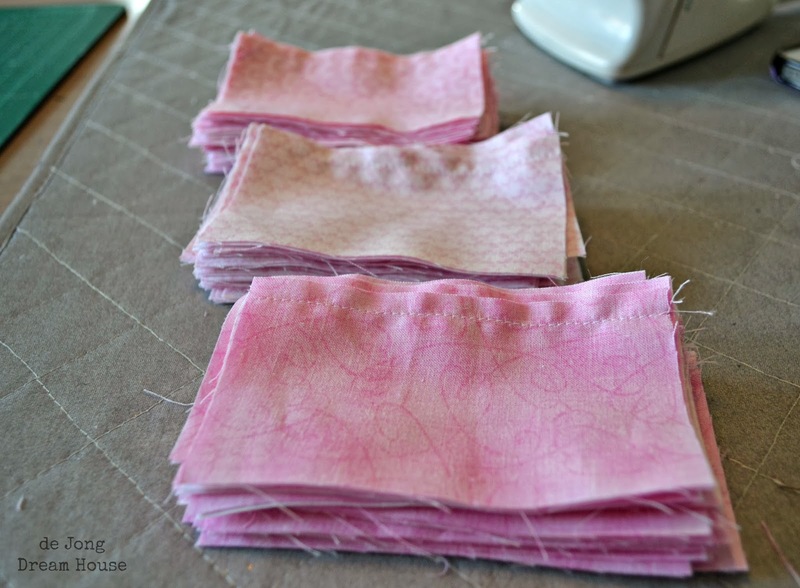 Also, how do you make your quilt labels? 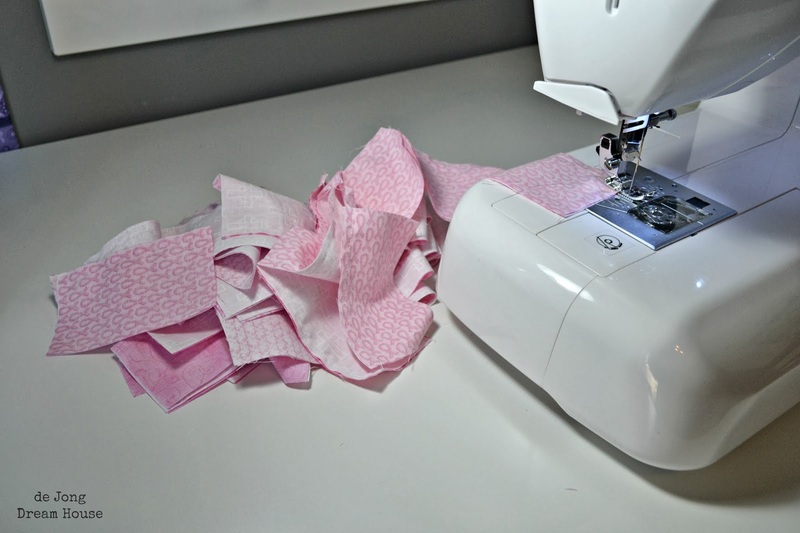 I use sheets of iron-on printable fabric (http://www.purplechimp.com/products.html). 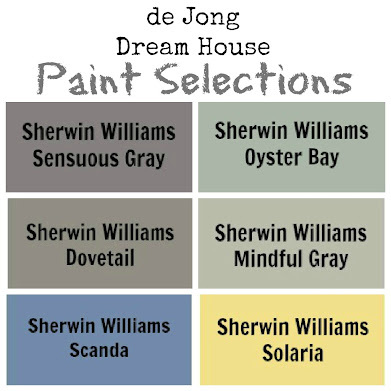 I design it in PowerPoint and then print them on my computer. 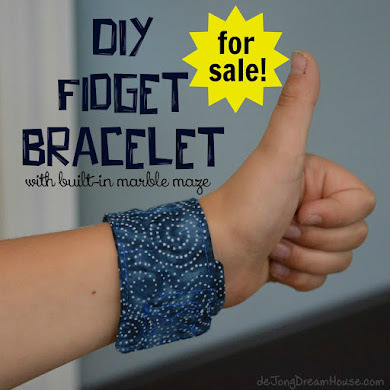 I'm sure with your design skills you could make some really cool labels!